PORTAGE - Scott Leep stood, arms crossed, smiling at a line snaking from the cash registers to the back of the fast food restaurant. A high school baseball team had just tumbled out of a bus, and two dozen boys in dirty uniforms and cockeyed caps jostled to assess the brightly lit menu: chicken sandwiches, chicken nuggets, chicken strips, salads with chicken. A year ago, Leep was spending his days with kids like the ones in line, teaching math and English at a tiny country school in Southwest Michigan. Today, he is general manager of a Chick-fil-A, serving up waffle fries instead of pop quizzes. How the 38-year-old went from teaching the Fibonacci sequence to breading chicken is a story particular to our age. It’s definitely a glimpse into Michigan economics – he makes more as a rookie general manager at the fast food restaurant than he did as an 11-year veteran teacher. More than that, though, it’s a window into the struggles of teachers – and of schools to keep educators from abandoning ship. Leep was one of 7,241 Michigan teachers – one in 12 - who left education in the 2016-17 school year. Some retired, but a national analysis estimates that two-thirds of teachers who leave the classroom do so for other reasons. If that estimate holds true in Michigan, about 80 school buses of non-retiring teachers call it quits per year. “Every single teacher that has left us, it is a tough decision for them,” said Doug Newington, superintendent of Climax-Scotts Community Schools, where Leep was a popular teacher until quitting last June. Leep earned his teaching certificate from Western Michigan University, and took a job at Climax-Scotts Junior-Senior High in Kalamazoo County, in 2006. With dual teaching certifications in math and English, he taught both subjects to kids in middle and high school. He volunteered to teach night school and was an assistant football coach. There was a job satisfaction that came with influencing young people’s lives that went beyond a paycheck. Then again, satisfaction didn’t pay the bills for his growing family. After 11 years and a master’s degree, Leep was earning about $50,000 a year to support his wife and two children. In early 2017, Leep decided to apply for a part-time job at a Chick-fil-A opening in Portage. For four months, Leep caught a ride with a friend at 5:30 a.m. each day from his Kalamazoo home to get to Climax-Scotts Junior-Senior High School, where he’d discuss the novel “Brave New World” one hour and linear programming the next. “I’d get home at 4:30, take a nap for an hour, then go to work at Chick-fil-A till midnight,” Leep said. He worked in the kitchen, breading chicken breasts in a flour mixture and frying them in peanut oil in a pressure cooker. “I was working 80 to 90 hours a week,” Leep said. Last June, Leep was offered a full-time position as general manager at the restaurant. He left the chair and the school supplies he’d paid for himself in his classroom of 11 years, and walked away from teaching. Michigan’s teacher turnover isn’t unusual. The state was slightly below the national average for educators leaving the profession in 2012-13, the last year national data was available. And the rate isn’t increasing: the same percentage of Michigan teachers left the classroom in 2004-05 as in 2016-17. Still, when one in 12 teachers leaves every year, it stunts learning. In general, teaching skills increase for at least the first five years a teacher is in a classroom. Veteran teachers like Leep often are replaced with teachers straight out of college. Students typically learn more in the classrooms of veteran teachers. What could keep an experienced educator like Leep in the classroom? More money would help, but Leep said it wasn’t the biggest factor. Michigan is 12th in the nation in average teacher pay ($62,000), but teachers like Leep who worked in rural districts often are paid substantially less. 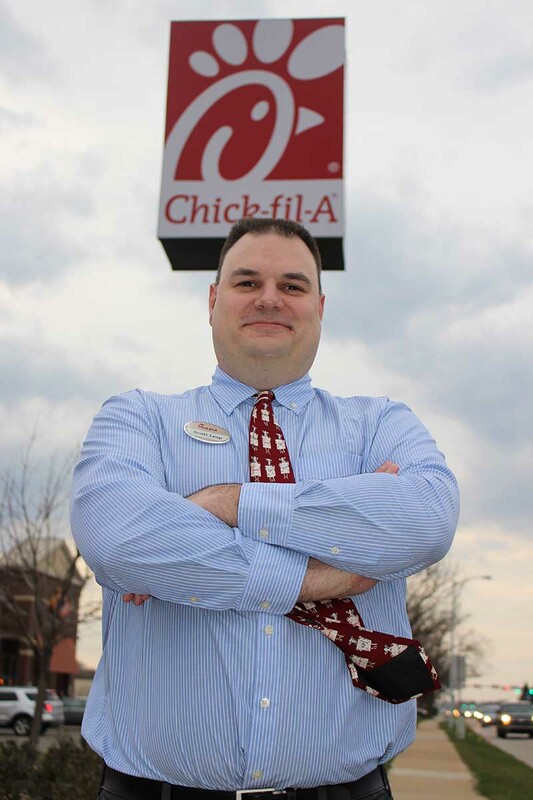 “It was a raise” to move from teaching to Chick-fil-A, Leep said. “But for me, (leaving teaching) wasn’t the pay or my colleagues or my superintendent. I loved teaching. “It was the politics,” Leep said. Leep said he grew frustrated being given the same standards for all students, and students are all judged on the same tests, like the girl from the broken home and the banker’s son are as interchangeable as the cuts of poultry Leep’s workers prepare each morning. At Chick-fil-A, every chicken breast weighs the same, is battered in the same mixture and is cooked for the same number of minutes, Leep said. Recently, Leep’s restaurant threw out a shipment of lettuce because of concerns nationally (not connected to Chick-fil-A) about an E. coli outbreak traced to romaine lettuce. “As a teacher, I don’t have that option. I have to work with the students who come in the door, whether they’re hungry or their father’s in prison, and try to turn them into success stories,” Leep said. “I’d lay in bed and think about the kids. Did they go home and have anything to eat? Did they go home and have anyone tell them they loved them? A good night’s sleep was rare. Because Climax-Scotts couldn’t find a teacher with Leep’s unusual dual certifications in math and English, the district was forced to hire two teachers to replace Leep. Superintendent Newington laughed as he noted that Leep probably would have stayed if the district would have paid him what the district now has to pay for two teachers. Those guests sometimes include former students. Leep hired one recently. Another sent him an English paper to edit. His advice to state leaders: Stop thinking of teachers as overpaid and underworked, and stop treating all students the same. “Teachers are looked at as the saviors of society,” Leep said. “I can’t fix every issue with a kid. Scott Leep's experience is absolutely representative of many teacher's experiences across Michigan, and our nation. I also was a high performing teacher, who left the classroom because of low pay and the high demands. I miss my students dearly, I loved being a consistent, caring adult in their lives. I am so grateful for and impressed by the educators that stay in the profession while raising a family, because it is far from easy. Thank you Bridge for writing this story, Scott's story represents so many teacher's frustrating experiences in our state. It's not just sad that a talented, caring, math and English teacher who kids loved was driven away from public schools like many others I know. It's outrageous that we continue to support selfish idiots in Lansing who seem to want to destroy public schools by under-funding them. To those of you who do not work in education, how would you like non-experts who do not work in (or know much about) your industry change procedures, missions, and goals every couple of years because it is the next great thing? This is exactly what this is like. I am not a teacher and do not have children, but as a citizen of this state I have been watching this and worrying about this for years. Add to this the mission creep that teachers are not only supposed to educate, but are to be social workers, health workers, psychologists, etc for their students. At the same time, the last ten years has seen everyone blaming teachers for everything under the sun. The vitriol directed against teachers has been appalling. Why would any talented, dedicated young person choose to go into a profession that is not respected? This state is reaping what it has been sowing for years -- an under prepared work force. The reality is that every industry that is regulated by the government is done so by in experienced, under educated, people that are more about control than results. The issue is that the educational community had decade of experience by others and were unwilling to learn from their lessons. Every time there was concerned raised about the results in student learning the educators said leave us alone we are the 'experts'. The lessons others learn was the more you build a wall around yourself the more it pushes people to turn to politicians to do something, and when there is such a vacuum in trust the politicians do what looks good to the media, the media is under informed, it screws things up. Even today the educators are saying all we need is more money [that's all this article is about] and leave us alone. Until the educators are will to acknowledge and then include those that have a role in the student's learning nothing will change. You mentioned your reasons why you didn't feel to have the expertise on this topic, but in reality you were for a number of years a 'job expert', you were a student. If you reflect on that experience you will find patterns, activities, and events that impact that experience and you success. Mr. French and his editor had a focus for this article [get more of other people's money to the government] so we don't get much of Mr. Leep's understanding and ideas about 'educational' system. The reality is that teachers are coaches, they present the information, it is the student that has to do the learning. Recall you time in the classroom, wasn't there a distribution of academic success in the classroom [where everything was the same except the students?]? Doesn't that suggest that there is more to learning success than just the teacher? There is a core of knowledge and skills necessary for a person to chose well, and all aren't one to be learned in a classroom, but who should be deciding what those topics are? The questions we should be asking what does it take for a student to learn, why and how do some students learn, what are the barriers they are facing to learning, how do we help other apply those lessons. Reflecting on your experience what are your answers? I can point to those who succeeded and all worked at their learning. Bridge, excellent article about Mr. Leep and the tough decision he had to make , leaving the classroom for a job in the private sector. Mr Leep exemplifies the resume of the professional educator I would employ in a heartbeat: Dedicated to his students, intelligent, and works beyond his job description. It is time that Michigan and Federal lawmakers begin seeking input from professionals, like Mr. Leep, before creating laws and policies that fit particular agenda rather than what is best for children. Mr. Leep, call me if you decide to return to teaching. Dr. Mike Shibler, superintendent of the Rockford Public Schools. As a fellow teacher, and a resident of your community, thank you for all of your advocacy toward teachers, students, and the profession, Dr. Shibler. I, along with many others in the field, appreciate your ability to speak truth to power. I couldn't agree with you more. I recently retired after 40 years in education; 30 as a principal. Far too many teachers, like Mr. Leep, are leaving the classroom due to unrealistic demands on them. Our legislators, with very little knowledge about education and learning, continually pass laws that negatively impact students, teaching and learning. Each year it becomes more challenging and discouraging to be a teacher. With that said, education is still a wonderful calling with many rewards. Scott made a choice that makes sense to him. Michigan voters have made the choice to elect clueless State School Boards and intrusive legislators. We continue to follow guidelines and regulations from state bureaucrats who have driven our education outcomes from mediocre to pathetic. We are idly standing by as another generation of kids are poorly served by a anachronistic system of education. Where are the leaders who will remake our "system" of education to match all that we know about how kids learn, to deal with the reality of the many social-emotional needs kids bring with them to school, to treat students as individuals and offer them instruction at their level of readiness, and to attract and keep the high quality teachers who are necessary for an effective education system? class and seeing him drained every day from doing the same tedious thing day in and day out, i'm sad he left our school because again he was truly a great person to have around but it makes me feel better knowing his struggles seem to be lifting and that he can not only be there to support his family but he can also financially help them as well all the luck to ya Scurt Lurp a.k.a. Oh Captain My Captain. 1) the average salary of $62,000 is deceptive. My friend has worked 10 years with no raises and is earning $35,000 a year! It's the older teachers that skew the average. This directly effects point two. 2) Enrollment in teacher education classes in college is down over 50% in Michigan. Why would anyone want to teach? 3) Another friend quit teaching and is making a lot more money. Ironically he also finds he has lots and lots of free time during the day! Didn't have that teaching 26 third graders. 4) When are Michigan teachers going to go on strike? Don't ask for a raise, ask for the back-pay you didn't get these past 10 years. It’s illegal for teachers to strike in Michigan. Legislators passed this some time ago and there were extremely punitive measures passed with it. As a 12th year teacher in Michigan I am willing to strike regardless of the laws. Let’s see what the state/districts do when they have to hire 100,000 new teachers because we went on strike. Those in charge aren't intelligent enough to realize that would be a problem. Thank you for pointing that out, George! The older teachers definitely skew the average as do the ones in the suburban districts. While I don't begrudge anyone making $70k-80k, it is important to remember that those of us with only about 10 years in and who work in Title 1 districts definitely DO NOT get paid that much. And we probably never will thanks to pay freezes and cuts. Even though I'm about halfway up in the steps, I still bring home about what I did when I started because of the increased insurance costs, increased pension costs, and so on. Thanks for printing this story. It encapsulates the personal and financial dilemmas of so many good teachers today, and explains why teaching has become so frustrating. I believe we did a much better job of educating our kids generally when teachers were free to teach, led by principals who cared, and not bludgeoned by standardized test results. I am so sorry to read about Scott. We want to encourage good teachers to remain in the classroom, and there are so many like him. He seems to have genuinely loved his students, district and even his administration. This is a story I am hearing and reading all too often. Teaching is among the most noble of callings harkening back to the great teachers and religious leaders of antiquity. I think we are losing our way. I made a similar decision almost 30 years ago. Taught high school and loved it. But we had 4 kids and just could not survive on the salary. We had one old car and when it broke I could not afford to get it repaired. I was looking into going into administration when an opportunity outside of education popped up offering about twice what I was making as a teacher. I jumped. Still miss being an influence in the lives of those teenagers but I did what I had to do to keep my family afloat. Its been said many times. In a perfect world, the best amongst us would be teachers. All others would have to settle for something less. Michigan is a long way from being a perfect world. I gave 40 years to education including 30+ as a classroom teacher. I would not pursue this field of work if I were graduating from college today. The "badmouthing" of teachers is at record levels. Lack of professional respect and the political climate really do more to exacerbate this situation than pay. Excellent article. This is true in every state! I'm a product of public school but from the 60s and 70s before politicians, unions whiners and pc police wrecked education. From the time I was in school until the time my son was in Jr. and Sr. high, political correctness and revisionists have made education a joke along with every new fad for teaching that comes down the pike. Education should not be one size fits all because children and adults are not made that way. We are doing our kids no favors by taking the wars and their history out of the history books and replacing it with a blurb like, and that led to World War II. Kids today have no concept of why people fought what they fought for and how their lives were affected because of it. They are totally influenced by fake news politically correct text books and the lies being told as truth from both political parties. They are nothing more than robots repeating what they have been conditioned to think and feel. There are exceptions and im not saying all kids are cheates but many are. We were not taught America is bad or white men and black men are evil. We were taught that there are good and bad in every color and every nationality. We were taught both sides of slavery and we still knew it was wrong. We knew this country was divided and why and we also understood that some being honored or a statue erected in their honor never stood for their perfect life! It meant at one time that person did something great. America and its people are not perfect but people make it great, People like the nerdy kid setting next to you in science class or the shy kid in gym class. It's time to be great again in education and get rid of politics and agendas in text books. Start giving the teachers what they need and the pay to go with it before more generations are clueless why this is a great country and the people living here are good people, free people. Well said. This is the exact problem today. Thank you. Yet with all this the US spends at the top of the heap of all OECD nations while getting middling to low results. What gives? The comparison with Finland is interesting but not all of what most Bridge readers would think. Compensation isn't that different - especially considering the Scandinavian cost of living. Maybe we are trying to do too many things with our schools? This article should be required reading for every Michigan legislator. If you can't live, well, on $50K a year you need some education in budgeting and money management more than you need a second job. School support staff are living on half that. I'm not against paying teachers more but I'm tired of hearing how they can't make ends meet. What you may not realize is that although $50,000 sounds like a decent living, after everything is taken out, they are actually living on less that $30,000 per year...take out $12,000 for a modest house payment and they are looking at $18,000...that’s for bills, car payments, food, daycare, possible student loans, etc...these are professionals often times with graduate degrees and beyond...this isn’t okay. More than that, most teachers also feel obligated to pay expenses that, in almost every other profession, would be covered by the employer. Paper, pencils, chalk, dry erase markers, Kleenex, hand sanitizer, disinfectant wipes, paperclips, staples,etc. How many nurses pay for bandages and IV tubes for their patients? How many engineers pay for their own blueprint paper and pens? How many IT Techs pay for their clients mouses and network cables? One difference is that teachers have bachelor's degrees (or more), so they are probably paying off student loans, which support staff generally are not. At any rate $50,000 is not a generous amount to live on with a family of four. I'm guessing that's gross, so net after taxes, health premiums and retirement savings is probably closer to $35,000. Average home prices in that region are $200,000, so that's roughly $1,000/month in mortgage, plus escrow and utilities (total of probably $1,700+ per month). Food for a family of four is easily $600/month. Gas, insurance, maintenance on probably two cars. Clothes, toiletries and other regular expenses. That doesn't leave much for savings/college savings, not to mention unexpected expenses like car or home repairs. The problem is not that teachers make too much, it's that support staff make too little. I am a Michigan English teacher with 25 years experience in public schools. I am retiring in a few short days! I comment on this well-written article because it is our truth. Please commend the writer. Scott, we are so proud of you! You are a success! We could tell your crew loves and respects you! You were a superb teacher! When Aubrey went to school there, she loved going to your class. You were someone she could always count on. Your kindness and generosity was valued so much. Thank you for being the kind of teacher that was passionate about the kids and their success. I'm positive that you're a superb employee and appreciate the Christian values set in place by the corporate owner. Wishing you the best in all that you do! Bottom line it's a personal decision, and I find it difficult to fault anyone for making a decision to improve their life, but as the old saying goes; "Find a job you love and you'll never work a day in your life." This bromide belongs in the oh please hall of fame. Chris tell that to the teacher making $32,000 a year and paying 20% of their insurance costs. union dues, soc.sec. medicare and oh yes 10s of thousands of dollars in student loans. Good luck. R.L. Based on the last contract for Climax-Scotts schools, he was making around $47,000 on a base pay, with other additions for student head count, and other adjustments. For argument's sake, lets say by 2017, he was at $52,000 a year. When you take into consideration the state retirement fund, health insurance, employer taxes, and other perks and benefits, his total package is probably closer to $85,000 a year. I guarantee he won't have the kind of retirement package at Chick-Fil-A that he had in the state retirement fund. I don't begrudge anyone for making a living, in this case he chose to move into the private sector. Many teachers know they can make more there, yet choose to stay in education for all the right reasons - kudos to all of them. As the spouse of an educator, I see the same problems many of you have highlighted - things like excessive testing, mandates from those in power, etc. I also see a culture of helicopter parents who refuse to believe that their child does anything wrong, and refuse to force their child to take ownership of things when they do go wrong. One of my wife's colleagues always says, "The best place in the world to teach is an orphanage." Not sure that's true, but the spirit of what she's saying comes through. This is story is "nice", but meaningless. One can say the same for many professions outside a major metropolitan area. An Internist in the Detroit Area probably makes $100K more per year than in Portage, an Engineering Mgt Professional probably the same, etc. One has to take into account one's personal situation, lifestyle, skillset, opportunities available, area cost of living, etc. GOP hates teachers and public schools but disguises this by attacking teachers unions. One certainly cannot blame Leep for the choice he made, but it also seems appropriate to note that Superintendent Newington essentially admits his own incompetence with that short quote: he clearly does not recognizes and reward the effective teachers in his district in a fashion that keeps them in the classroom, nor does he seem to fully understand the financial importance of actively controlling the average cost of instruction per student. Mid-level administrators are just as much a part of the problem as our political class, if not more so. The majority of them lack both the required skills and personal characteristics.